Tony Mayer, Paris; sale, Mayer Collection, Galerie Charpentier, Paris, 3 December 1957, no. 27 (illustrated). Anon. sale, Sotheby's New York, 4 November 1993, lot 156. L. Venturi, Cézanne, son art - son oeuvre, Paris, 1936, p. 237, no. 809 as Allée des marronniers au jas de Bouffan (illustrated pl. 268). 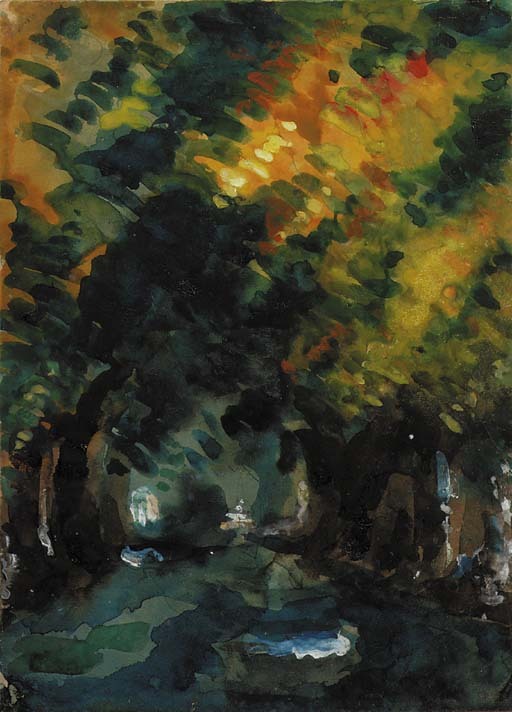 J. Rewald, The Watercolours of Paul Cézanne, A Catalogue raisonné, London, 1983, no. 5, p. 53 (illustrated pl. 5). London, Thomas Agnew & Sons, Watercolour and Pencil Drawings by Cézanne, 1936, no. 1. The motif of the tree-lined avenue, traditionally favoured by the Barbizon painters, became central to Cézanne's creative output at the beginning of 1860s. In a departure from the Barbizon model, Cézanne rarely focussed on the anatomy of the trees, nor was he interested in the depiction of their majestic silhouettes, romantically cast against atmospheric skies. Instead, the artist preferred to crop the chestnuts, emphasising the tufts of green and concentrating on the perspective of the smooth trunks, caught in deep succession. Above all, he was interested in colour. As this work demonstrates, the depictions of tree-lined avenues such as the present work reveal Cézanne more attentive to the flamboyant combination of bright yellows and intense greens, and seized by the play of light and shadow - a colourist, first and foremost. Une allée epitomises the artist's incessant preoccupation with chiaroscuro, conceived as a crucial tool to achieve his complex plastic tensions. The palette of this watercolour is typical of his mid 1860s endeavours: ranging from the almost white of the chestnuts' crowns to the very dark green of the undergrowth, it explodes in the central yellow, the chromatic centre of the composition. This subject, to which Cézanne was attracted since the late 1850s, became particularly prominent in his oeuvre after 1859, when his father Louis-August purchased the 18th century provençal bastide known as the Jas de Bouffan. In the words of H. Loyrette, this was 'a large blocky structure, rather severe, with a red-tile roof and stone walls covered with yellow stucco, [...] situated near Aix on a fifteen-hectare plot encompassing tenant farms and vineyeards as well as a modest pleasure garden with an oblong pool and an allée of old chestnut trees' (Exh. cat, Cézanne, Philadelphia and Paris, 1996, p. 126). From 1859, the young Cézanne spent his summers in the Jas, and soon he made the chestnut allée one of his favourite pictorial motifs. In 1864-66 he executed some powerful palette-knife paintings of the trees (R. 62-65), now focussing on the chestnuts' perspective, now portraying the stone water-spouting lion at the corner of the pool, with the chestnuts in the background. The most mature of these compositions, famous for its subtly nuanced harmony of dark and light greens, was probably painted at the beginning of the 1870s, and is now in the collection of the Tate Modern in London (R. 158, fig. 1). The remarkable proximity of the present watercolour with these oils - both on the iconographic and stylistic level - prompted Venturi to publish it as 'Allée des Marronniers au Jas de Bouffan' (op. cit) and to propose a date of circa 1870. Whilst acknowledging Venturi's suggestion, Rewald preferred to broaden the field of possible provençal landscapes, and was more cautious with the identification of the allée. Since the sheet does not feature the pool nor the stone lions, it can also be a depiction of the dramatic chestnut avenue leading to the Tholonet, one of Cézanne's favourite motifs in the countryside near the Mont Saint Victoire. Please note that the present work is attached to the mount at the edges, not fully laid down on paper.